Two sheltered housing schemes owned by South Lakes Housing (SLH) have been refurbished following the damage caused by storm Desmond on 5th December 2015. At Birthwaite in Windermere, eight ground floor flats were flooded and at Edgecombe Court in Kendal four were flooded. In total, the floods severely damaged 60 of SLH’s properties with the average repair bill being around £30,000 for each home. Many tenants were forced to move into temporary accommodation before they finally moved back into their homes. SLH worked extremely hard to get tenants back home and the £2 million pound recovery programme was completed in August. The refurbishment programme consisted of; removing contaminated timber, providing new kitchen units and plaster and raising electrics. Flood resilient water proof membranes have been installed in most homes together with raised balconies at Edgecombe Court, a flood storage detention basin at Birthwaite, new air bricks and flood gates amongst a package of other measures being taken to help the properties prepare for future flooding. Six residents were evacuated at Birthwaite by the Mountain Rescue team and the waters almost reached the electrics in the boiler room at Edgecombe Court narrowly avoiding the need to move over 40 tenants out the scheme on the Saturday night. The schemes were officially reopened by John Holmes, Chairman of the SLH Board at two afternoon tea events on the 6th September (Birthwaite) and 7th September (Edgecombe Court) 2016. SLH Chairman John Holmes said “The reopening of the schemes is an opportunity for us all to reflect on what happened and to thank a lot of people for the efforts they gave. We are also keen to learn lessons and to keep tenants involved in managing flood risk going forward”. The community spirit shown at the schemes has been fantastic”. SLDC Councillor for Windermere, Cllr Ben Berry said “It is fantastic to see residents smiling and having fun. The carpets on the floor is a welcome sight to what it was just a few months ago“. 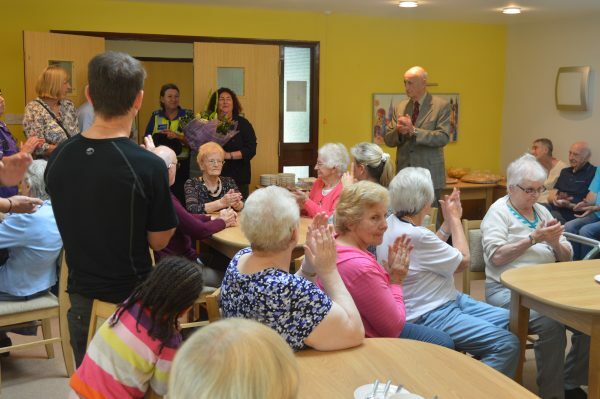 SLH Chief Executive, Cath Purdy presents a bouquet of flowers for the residents lounge.